One Manhattan Square, an 800-foot-tall glass tower in Manhattan’s Lower East Side, is at the center of a grassroots battle against displacement. Designed by Adamson Associates, the Extell Development–backed skyscraper threatens to push out throngs of immigrants and longtime local residents who call the area home. It’s a common story found in the ever-evolving city, but this particular narrative possesses one distinct difference: It’s location. Since much of New York’s luxury residential building boom has focused on expanding Hudson Yards, buffing up Billionaires’ Row, and readying Long Island City for Amazon’s HQ2, the Lower East Side has been somewhat unaffected by such large-scale development. Until now. A series of sky-high apartment buildings, starting with the nearly-complete One Manhattan Square (also called Extell Tower), is slated to dot the Lower East Side waterfront enclave known as Two Bridges. Four planned towers are in the works, although One Manhattan square is the only one currently under construction. The surrounding community is predominantly composed of Chinese immigrants and working-class people, a major reason why the city designated the neighborhood a Large-Scale Residential Development (LSRD) area in 1972, which protects and promotes affordable and mixed-income housing for residents. According to Zishun Ning, leader of the Coalition to Protect Chinatown and the Lower East Side, the proposed high-end projects violate the LSRD, which requires that all new developments secure approval from the City Planning Commission or receive special permits through the Uniform Land Use Review Procedure (ULURP) process. Ning argued the city's decision to move forward with the Two Bridges development is therefore illegal, and indicative of discrimination from the mayoral administration. Not only is it politically fraught, according to Ning, it's socially irresponsible. The towers are situated within a three-block radius of each other and will sit near NYCHA housing. One will cantilever over an existing senior center and another, One Manhattan Square, will feature a “poor door,” as the coalition calls it, for the building’s affordable housing residents. Yesterday a slew of protestors gathered at the 80-story tower and marched to City Hall in opposition to the plan. Ning said the day’s event, officially titled the March to Reclaim the City, was the coalition’s latest attempt to get Mayor de Blasio’s attention. “We’re not against development,” Ning said, “we just want some regulation and future development that fits our community.” Last fall the group submitted an alternative proposal to the commission in which the neighborhood could be rezoned for more appropriate use. They integrated height restrictions on new construction and called for 100 percent affordable housing on public land. Ning said their efforts were ignored, and in early December, the commission approved a special building permit submitted by the developers. The commission said the projects only presented a “minor modification” to Two Bridges’ zoning law and that a full Uniform Land Use Review Procedure (ULURP) process would not be required. “It’s evident that racism plays into the city’s zoning policies,” said Ning. “They rezone communities of colors for the interests of developers. We call out the city’s illegal approval, along with Mayor de Blasio’s collusion with developers to approve these towers and deny our plan that came out of a democratic process. We want to reclaim our democracy and control as a community.” History has seen many local working groups stand up against giant developers and influential politicians, but, according to Ning, there needs to be more support from area architects to help such groups envision a bigger, more inclusive picture for their neighborhoods. A new collective of aspiring architects and non-architects interested in the field, citygroup, wants to do just that. The organization aims to become a young social and political voice for the architecture industry. Members gather periodically for informal debates on serious topics like the need for affordable housing in New York, the nature of architectural expertise, and architects’ tricky relationship with real estate developers. The group's inaugural exhibition, set up inside its new space on the Lower East Side, details various visions of One Manhattan Square that imagine a more useful development for the local community. “We wanted to rethink the Extell Tower as something that isn’t as foreign to this neighborhood as it is now,” said Michael Robinson Cohen of citygroup. “It’s built on a plinth and houses mostly luxury apartments. We asked ourselves, How could we recreate the tower for different uses or for a diverse group of inhabitants?” The exhibition centers on a series of 21 drawings done by different citygroup members. These individual visions, expressed within the confines of the building’s plan, feature different ways to reuse the tower’s 1.2 million square feet of space. Some pictured it as pure parkland, others cut it up into a grid of 3-meter-by-3-meter apartments. One strips away the idea that a housing complex must cater to the traditional single-family home by creating personally-designed apartments outfitted for everyone from single moms to yoga teachers, a Russian oligarch, a cat lady, and even a family of five. Thinking critically about megaprojects like One Manhattan Square, according to Robinson Cohen, allows architects to investigate the best ways for new developments to improve a community, instead of displacing residents and stripping away the character of a neighborhood. “Much like the coalition, we’re for challenging the tower, but are not against development in general,” he said. “Obviously, as architects, we want to build and it’s clear the city needs more housing, but to us it’s important to think about the people these developments serve.” To Ning, the architect’s mission isn’t far from that of the Coalition to Protect Chinatown and the Lower East Side. He says the two parties can work together to imagine developments that engage with local residents rather than taking away access to light and air. “We actually encourage architects to put their creativity into building things that benefit the community,” Ning said. “But in order for that to happen, we first need to fight the city.” A new lawsuit against the City was just brought on by the Lower East Side Organized Neighbors in opposition to the development. The Asian American Legal Defense and Education Fund (AALDEF) is slated to support with future litigation efforts. Until then, the City is still contending with another lawsuit calling for the towers to go through the ULURP process, initiated by City Council Speaker Corey Johnson last month. “These towers are just one piece of a bigger picture,” noted Ning. “If 3,000 units are added to the neighborhood, the demographics will change and the land value will rise. Harassment and eviction will escalate. This is happening all over New York City. It’s segregation, and it’s very visual.” Walk-throughs of citygroup’s exhibition are available upon request through early February at 104b Forsyth Street. Email group@citygroup.nyc for hours. Tenants' rights are top of mind in New York City right now in a big way. 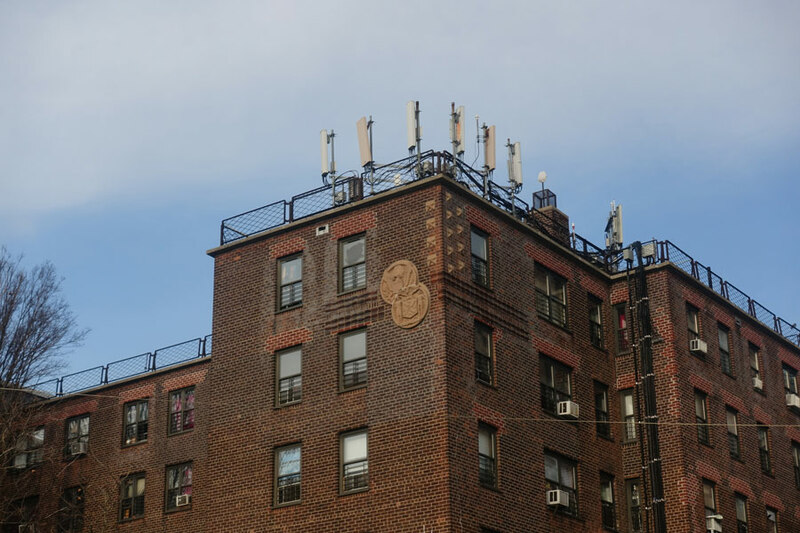 As affordable housing stock increases throughout the five boroughs, it seems as though the city government is taking a lead on ensuring the safety and financial wellbeing of local residents. Today in his sixth annual State of the City address, Mayor Bill de Blasio signed an executive order to establish the new Office of Tenant Protection, a group that would act as a liaison between different housing and building agencies in the city. It will launch at the end of this year and receive an operating budget of $450,000, according to The Real Deal. Once up and running, the office will review city data and tenant complaints in order to determine which landlords need more oversight. In some cases, the city will be able to assume control of buildings entirely. “When a landlord tries to push out a tenant by making their home unlivable, a team of inspectors and law enforcement will be on the ground to stop it in time,” said de Blasio in his address. 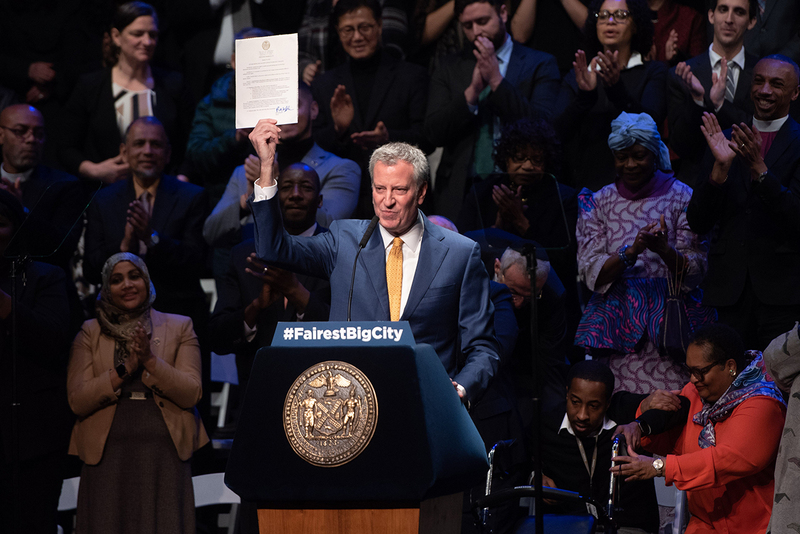 “If fines and penalties don’t cut it, we will seize buildings and put them into the hands of a nonprofit that will treat tenants with the respect they deserve.” The plan is part of a set of initiatives the mayor is touting to make New York the #FairestBigCity in the nation. In recent years, the city has set up similar offices dedicated to helping tenants, such as the Office of Tenant Advocate, which came online in mid-2017 and is operated through the Department of Buildings. As New Yorkers experience serious disturbances or harassment from construction, they can call upon the OTA for assistance. The city's Department of Housing Preservation and Department now provides equal help through the new Tenant Anti-Harassment Unit. In addition to these new direct-help government groups, de Blasio announced in December a multi-billion plan to fix and preserve the struggling New York City Housing Authority, an agency that had a particularly bad year providing quality affordable housing for its low-income residents. Other steps outside the mayor’s office are being taken to crack down on private and public tenant protection. In November, the New York City Council began reviewing 18 big bills to halt abusive practices made by local landlords regarding bad buyouts, false documentation, and incorrect permit filing. Learn more about the individual bills here. New York Restoration Project (NYRP) is a non-profit organization driven by the conviction that all New Yorkers deserve beautiful, high-quality public space within ready walking distance of their homes. Since our founding in 1995 by Bette Midler, NYRP has planted trees, renovated gardens, restored parks, and transformed open space for communities throughout New York City’s five boroughs. As New York’s only citywide conservancy, we bring private resources to spaces that lack adequate municipal support, fortifying the City’s aging infrastructure and creating a healthier environment for those who live in the most densely populated and least green neighborhoods. Their work with the New York City Housing Authority (NYCHA) was the focus of the discussion. The Architect's Newspaper: What is New York Restoration Project doing to address borders? Deborah Marton: Borders we deal with are perceptual. Systems of management can impose socioeconomic borders on space. An example from our experience is that some people in certain groups don’t go to Central Park because they don’t feel comfortable there. These are people who live within walking distance of the park but don’t feel that it belongs to them as public space. AN: Can you tell me more about NYRP’s work on public housing sites in New York? DM: Public housing with the Corbusian tower in the park model is a failed paradigm in its insistence that the green space be green poche. These spaces became a no-man’s land that invited crime. New York City, New York State codified the standard of having fences everywhere making green space unusable and inaccessible. Fences were not just about maintenance. They presented an idea of control and policing. AN: How did NYRP get involved with the New York City Housing Authority (NYCHA)? DM: NYRP got involved with NYCHA beginning in 2008 because of the Bloomberg administration ‘Million Trees Initiative’. 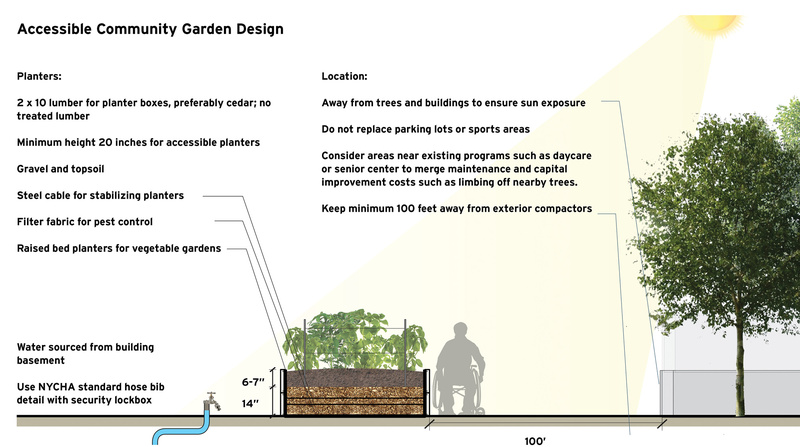 The Department of Parks and Recreation can only plant trees in parks and along streets. They cannot plant trees in space that is not parkland. The Bloomberg Administration invited NYRP to be its private sector partner because they could work across jurisdictions, including on NYCHA property where there is more open space for planting trees. AN: Can you explain how your involvement with NYCHA evolved? DM: Residents of NYCHA started applying to our program “Garden in the City.” The program provides resources to groups in high need areas who apply for support to make public gardens. NYRP supports groups that show the organizational capacity with stewardship and funding for their efforts. As we received more and more requests, the program led to a memorandum of understanding (MOU) between NYCHA and NYRP to do more projects. 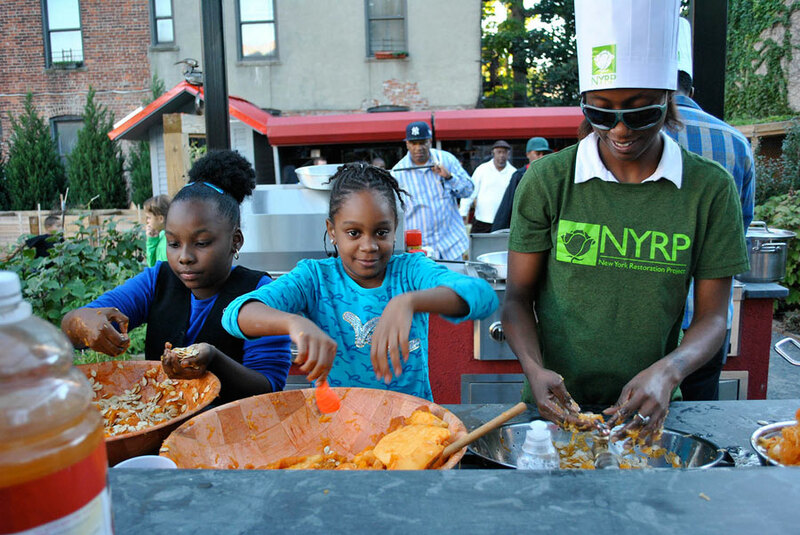 We are currently working on 50 or 60 NYCHA sites mostly to develop urban agriculture. AN: How did you engage the larger community? DM: We hold workshops that are open to the public where we provide education about how to develop, maintain, and manage community gardens. The gardens are also self-governing, managed outside of city structure. People in the neighborhoods around NYCHA projects as well as within can participate. AN: Beyond breaking down the visual and physical space, how did this change the community? DM: There are few spaces where people of different socio-economic and racial backgrounds can merge and collaborate. Community gardens create these kinds of places. Community gardens on NYCHA land have a geographic catchment beyond NYCHA property extending to broader neighborhood. We are working not only on gardens in NYCHA property but also have 52 gardens that we developed independently. Latest social science thinking suggests that social isolation is an ongoing contributing factor in lack of social mobility and advancement, poverty, mental health problems, and violence. Expanding community gardens is one of the most effective and least expensive poverty measures, reducing crime, improving public health. In a 2011 study the Philadelphia Horticultural Society and University of Pennsylvania Medical School conducted a study about the reuse of vacant lots in Philadelphia. One was control where they did nothing, a second looked group, they cleaned the trash, and in a third they added a simple lawn and fence and maybe a tree. They studied the area from 2011-14 and found that crime went down in groups 2 and 3 with the biggest impact on group 3 where people in the neighborhood reported a reduces feeling of helplessness and depression. You can read more about the project in a Fast Company article that came out earlier this summer entitled The case for building $1,500 parks. AN: How does NYRP work in New York City compare to the work in Philadelphia? DM: NYRP has been doing similar work for over 20 years and understood the value qualitatively which is now proven by more quantitative studies. Among the places where NYRP has made significant investment, East Harlem has experienced 150 less felonies/40,000 residents. Crime has dropped in general on the blocks where we built gardens. The community has stronger ties to the garden and to each other. Social capital and presence led to drops in crime. Daniel Libeskind has been a New York City resident since his teenage years, but, as has been noted, the acclaimed architect has yet to realize a ground-up project there. 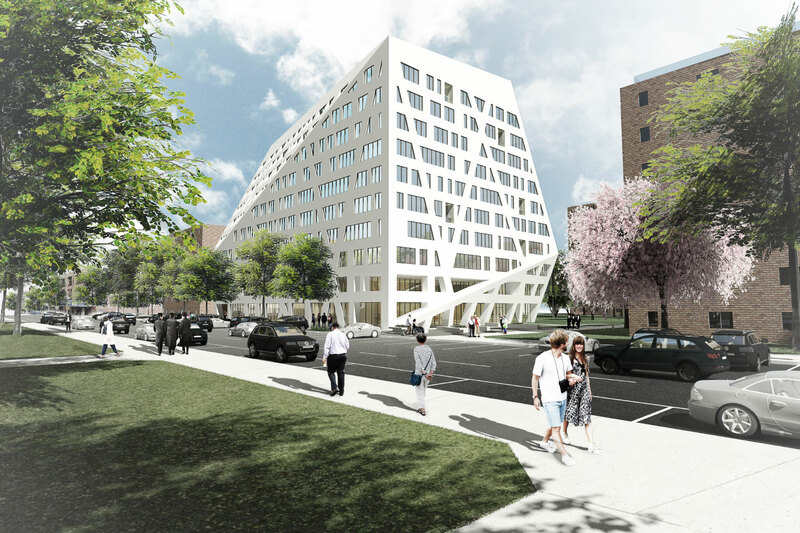 That may be about to change, as Studio Libeskind has released renderings of its geometric Sumner Houses Senior Building, set to rise in Bed-Stuy, Brooklyn. The collaboration between Libeskind and the city is part of the broader Housing New York 2.0’s “Seniors First” program, a commitment to build affordable senior housing on land owned by the New York City Housing Authority (NYCHA). The move was first announced in a January press release where NYCHA, the New York City Department of Housing Preservation and Development (HPD), and the New York City Housing Development Corporation (HDC) jointly announced four new partnerships under its 100% Affordable Housing program, its NextGen Neighborhoods program, and its FHA Vacant Homes program. Libeskind has been tapped to design senior housing on the western “site 2” parcel of the Sumner Houses superblock, a NYCHA-owned plot on the northern edge of the Bedford-Stuyvesant neighborhood. The 10-story, 129,928-square-foot apartment building will hold 197 permanently affordable units, along with over 10,000-square feet of ground-level community space for residents along Marcus Garvey Boulevard. “I am extremely grateful and inspired by this opportunity to contribute to the Bed-Stuy community,” said Libeskind in a statement sent to AN. “I believe I can speak for our entire team that our goal is to serve the senior community by creating homes that give a sense of civic pride and create more much needed affordable housing in New York City.” The firm’s design is a definite break from the boxy brick buildings commonly seen in affordable housing throughout the neighborhood. Libeskind has taken a more geometric approach, twisting and cutting away at the typical rectangular form to create an almost crystalline structure. According to Libeskind, the alternating open and solid elements and series of lifts and cuts are meant to create a lively interaction with the street and surrounding area. The building’s mass twists and lifts as it rises, and the double-height, glazed entrance lobby should give expansive views of the surrounding Sumner Houses block. Inside, corridor sightlines have been aligned to look inward on a central public courtyard. Construction on the Sumner Houses Senior Building should be complete in 2020. A comprehensive fact sheet on the building's affordability breakdown can be found here. 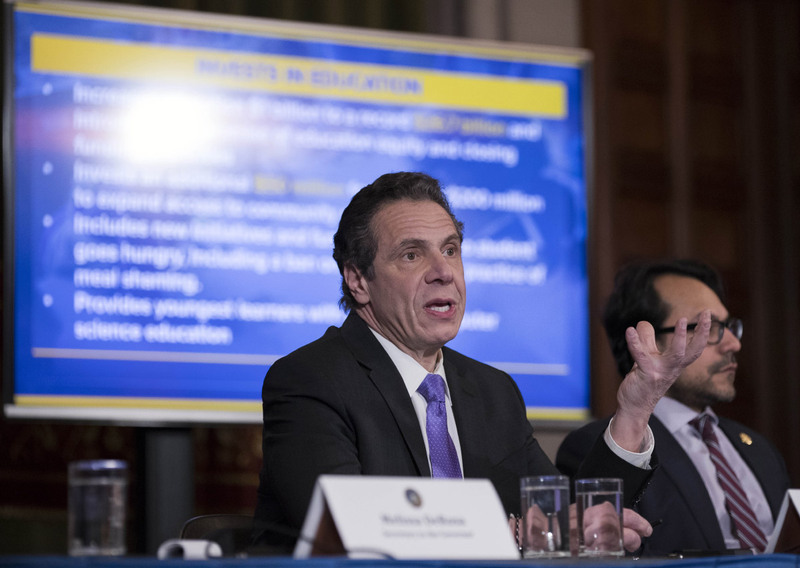 After a tumultuous series of negotiations over New York State’s 2018-19 budget that came down to the wire, Governor Andrew Cuomo signed off on a finalized $168 billion bill late last Friday. While a congestion pricing plan and the removal of density caps for NYC residential developments failed to pass, sweeping changes that could preclude a state seizure of the Penn Station area have made it through. The finalized budget provides a bevy of changes and funding initiatives that will affect New York-based architects and planners. In a move to stabilize city’s deteriorating subway system, $836 million was authorized for the MTA’s Subway Action Plan–with the requirement that the city government would have to foot half of the bill. As AN has previously reported, the money would go towards stabilizing the subway system by beefing up track work, replacing 1,300 troublesome signals, tracking leaks, and initiating a public awareness campaign to reduce littering. At the time of writing, the de Blasio administration which has repeatedly claimed that the city already pays more than its fair share, has agreed to contribute their $418 million portion. Congestion pricing, proposed by Governor Cuomo’s own transportation panel, failed to make it into the final legislation. The plan would both reduce traffic on Manhattan’s streets and could potentially raise up to $1.5 billion for subway repairs, but couldn’t muster enough support to pass. Instead, a surcharge on for-hire cars will be enacted below 96th Street in Manhattan; $2.75 for for-hire cars, $2.50 for yellow cabs, and $0.75 for every pooled trip. The terminally underfunded New York City Housing Authority (NYCHA) will also be getting a boost, as Cuomo has pledged $250 million for repairs across the agency’s housing stock. However, the boost is somewhat undercut by the federal government’s recent decision to restrict NYCHA’s access to federal funds as a result of the lead paint scandal rattling the agency. To save time and money, the budget has implemented design-build practices–where the designer and contractor operate as one streamlined team–for future NYCHA projects, the forthcoming Rikers Island transformation, and the delayed Brooklyn-Queens Expressway restoration. While one controversial plan to remove Floor Area Ratio caps in future New York City residential developments didn’t make it into the final draft, another even more contentious proposal did. According to language in the final budget, the area around Penn Station has been deemed an “unreasonable risk to the public". This formal declaration could be used in future negotiations between the state and Madison Square Garden as leverage, or even as a pretext for eventually seizing the area via eminent domain. The budget, which the New York Times described as a broadside against Mayor de Blasio, ultimately exerts greater state intervention across a swath of local issues, from education to urban planning. More information on the final 2018-19 budget can be found here. A longtime Trump family associate will soon be responsible for administering billions of dollars in federal housing funds. Lynne Patton organized the wedding of President's son, Eric Trump, coordinated Trump golf course tournaments, served as the Eric Trump Foundation's vice president, and is a senior aide to the Trump family. News broke today that—starting July 5—she'll be leading U.S. Department of Housing and Urban Development (HUD)’s Region II, which includes New York and New Jersey. According to the New York Daily News, Patton has a long-running relationship with the Trumps that goes back to 2009 when she started as their "event planner." However, questions have immediately arisen regarding her qualifications for her new role at HUD. Her LinkedIn page lists a J.D. from Quinnipiac University but includes a "N/A"; Yale University is also listed but with no additional information. The New York Attorney General also began "looking into" The Eric Trump Foundation after a report from Forbes appeared to expose practices that broke state laws. Patton's directorship at HUD will include block grants and rental vouchers that go toward senior citizen programs and housing inspections; The New York Daily News reports that HUD funds 100 percent of the New York City Housing Authority (NYCHA)'s capital repair budget and 70 percent of its operational budget. The role Patton is filling has been vacant since January 20.
Who knew the launch of a document about putting new rooftops on old buildings, raising boilers above flood levels, and updating kitchens and bathrooms in municipal housing would be the East Coast elite’s hottest ticket in town? The release of New York City Public Housing Authority’s Design Guidelines for Rehabilitation of Residential Buildings had to turn away dozens of attendees to its January 12th panel packing three stories at the AIA’s Center for Architecture. Part of the reason for the overflow crowd may be the sheer number of partners, collaborators, and offices involved. Led by the agency’s Office of Design, the Design Guidelines implicated its Capital Projects and Energy & Sustainability divisions, affordable housing developer Enterprise Community Partners (ECP), the AIA’s Design for Aging and Housing Committees, participants in NYCHA’s Design Excellence program, including Andrew Bernheimer, Domingo Gonzalez, and Claire Weisz, and dozens of maintenance staff members and residents. Produced in collaboration with ECP and supported by a $100,000 grant from Deutsche Bank, the Design Guidelines belong to Mayor Bill de Blasio’s NextGeneration NYCHA, a 10-year agenda to ensure the long-term viability and sustainability of America’s largest and most successful public housing agency. “This will impact all of our capital projects,” Eisenberg said. “We have a five-year plan of scheduled projects, and so we really wanted to raise the bar of design in how we execute them. This is a roadmap to enable us to do that.” It has implications for a vast and practically unending scope of work. If fully funded, renovation of NYCHA projects, which comprise 2,500 acres in 328 complexes containing 125,000 units and serving more than 400,000 residents, would require $17 billion in current capital costs. Allocations over the next three years amount to $784.4 million from the city’s budget. In some parts, the Design Guidelines formalize the standards employed in recent capital projects, such as the exterior lighting installed at Castle Hill and Butler Houses in the Bronx, which replaces the dim yellow light of old with nearly 1,000 bright and energy-efficient LED fixtures to improve public safety. In other outdoor areas, the guidelines aim to reduce metal fencing around grass and add amenities to create more active and healthy spaces. They take cues from the guidelines set forth by the Center For Active Design, while encouraging visual sight lines. In-progress projects like KPF and Olin’s landscapes for Red Hook Houses—funded as part of the post-Sandy $3 billion FEMA recovery grant—indicate a High Line–like attention to detail. 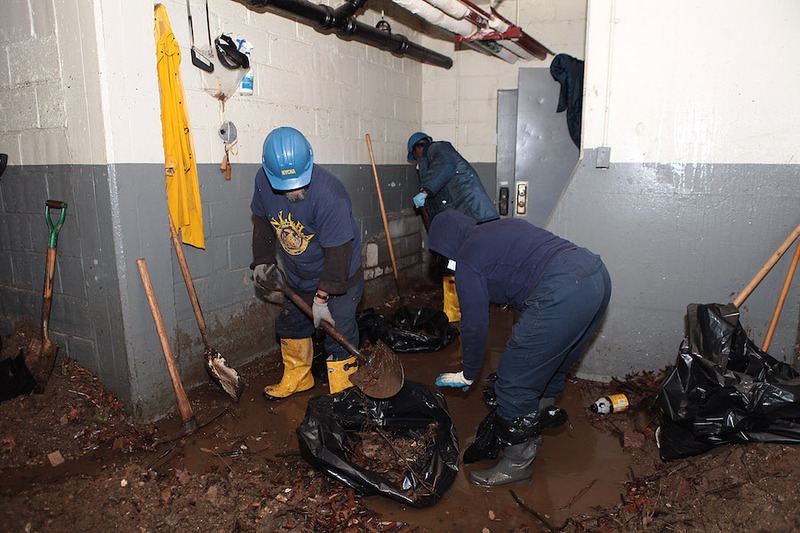 NYCHA’s push toward environmental sustainability nudges projects to install subsurface infiltration systems, sidewalk bioswales, and porous pavers rather than asphalt to limit stormwater overflow and heat sinks. 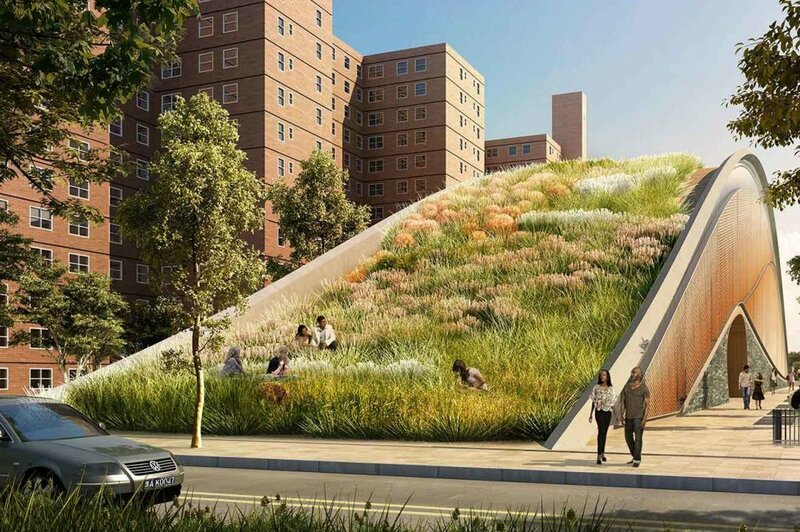 Pilot projects in Bronx River Houses, Hope Gardens, and Seth Low Houses will slow stormwater, while the Edenwald Houses in the Bronx will contain the city’s largest green infrastructure installation. For other areas vulnerable to stormwater rise, the guidelines recommend concrete retaining walls to double as seating, like the floodwalls as wood-clad benches by Nelligan White Architects in Baruch Houses below the Williamsburg Bridge. At Sotomayor Houses, NYCHA will begin installing the new standards for kitchens and bathrooms later this year, expanding cabinet space and adding accessible grab bars and sinks. That is, after the roofing is done: Mayor de Blasio has dedicated $100 million annually to roofs alone for the next two years, recently supplemented by another $1 billion over 10 years. Upgrading the troublesome low- or no-slope roofs of its modern-era buildings is NYCHA’s biggest capital projects burden. The Design Guidelines’ release landed on the same day as nomination hearings for Housing and Urban Development Secretary Ben Carson, adding a collective spirit of defiance to talk of preserving the country’s largest public housing agency. The De Blasio administration vows to press on, regardless of the new administration’s priorities, which appear to involve gutting all federal agencies the President’s cronies cannot use for profiteering. This morning, some fifty people gathered outside Trump Tower's fifth-floor public terrace to protest proposals from New York Governor Cuomo and President Trump that would affect affordable and public housing in New York. The event was organized by Alliance for Tenant Power and Real Rent Reform, two grassroots coalition groups that draw support from a range of New York City tenant organizations, labor unions, not-for-profits, and advocacy groups. The teach-in started at 11:30 a.m. as protestors arrived just outside the terrace entrance, located on the top floor of the Tower's large central atrium. Prior to the election, Trump Tower's two tucked-away public terraces seemed to exemplify the slight-of-hand developers can use to leverage extra development rights without meaningfully giving back to the public. Recently, they've become a venue for protestors to gather at the heart of President Trump's most prominent development. This time, however, the fifth-floor terrace was closed due to reported icy conditions. To this reporter's eyes, it was a plainly flimsy excuse. (The four-floor terrace is still closed due to construction, according to a sign outside its entrance.) 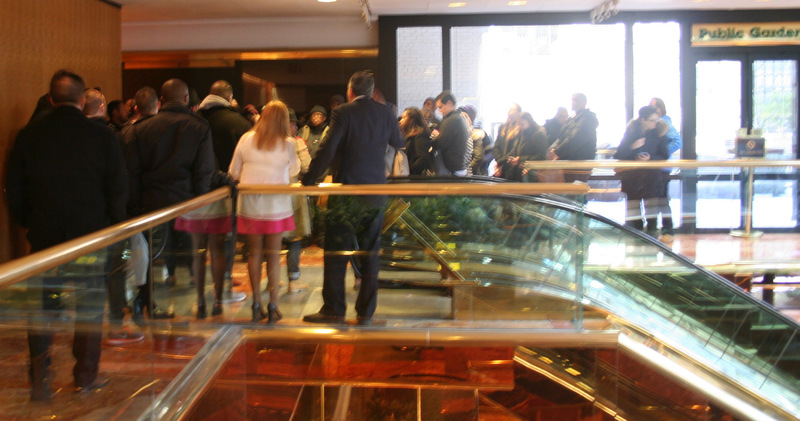 Civil rights attorney Samuel B. Cohen was on hand to speak to Trump Tower staff and inquire about the space's closure. Just like a sidewalk or any other public space, he told the crowd, Trump Tower has an obligation to clear the space for public use. Regardless, the teach-in continued, as the NYPD did not express safety concerns about the crowd. 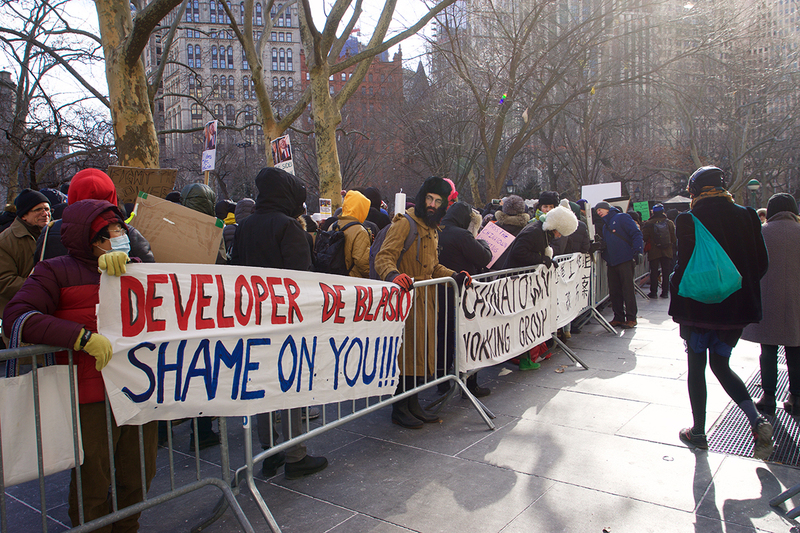 Over the course of approximately 45 minutes, protestors spoke out against Governor Cuomo's proposed renewal of the 421-a tax break, which is designed to spur the development of multi-unit buildings on vacant land. Tom Waters, housing policy analyst from the Community Service Society, said 421-a was a product of the 1970s, an era when the city was in dire straits. "Those times are over," he said, adding that 421-a would create far more value for developers than for the public. Waters also spoke out against a new provision in the bill that extends 100 percent tax-exempt status for certain new affordable developments from 25 to 35 years, a move which could generate further profits for developers. Waters also explained that Trump Tower itself was a product of 421-a tax exemptions when it was built; according to The New York Times the project received "an extraordinary 40-year tax break that has cost New York City $360 million to date in forgiven, or uncollected, taxes, with four years still to run, on a property that cost only $120 million to build in 1980." After being initially denied 421-a exemptions for Trump Tower, Trump successfully sued the city, and he later won 421-a exemptions for his Trump World Tower under the Guiliani and Bloomberg administrations in a similar fashion. Massive cuts to federal housing programs were an equal source of ire: According to a press release issued by Alliance for Tenant Power and Real Rent Reform, President Trump's proposed budget reduces federal housing funds by 13 percent. Those cuts "are expected to strain public housing programs and axe $75 million in federal funding from the New York City Housing Authority, the agency that manages public housing in NYC," the groups said. The Community Service Society estimates that Governor Cuomo's proposed 421-a program would "cost NYC taxpayers $2.4 billion annually and yield minimal affordable housing units in return." In the face of federal cuts, Jawanza Williams of VOCAL NY urged New York State to take a more aggressive stance to fill in the gaps and create its own robust health care and public housing systems; he also argued that 421-a would "only exacerbate gentrification." Claudia Perez of advocacy group Community Voices Heard added her thoughts in a question to those assembled: "Will you help me fight against the developer-in-chief? Now more than ever, New York must protect NYCHA." "We're calling on Cuomo to realize these $2 billion in cuts are more Trumponian than Trump," said New York City Councilmember Jumaane Williams at the protest. "So if [Cuomo] wants to run for president, if he wants to be a champion of saying what New York City is going to do to push back against these Trumponian cuts, 421-a is not it." New York City's perennially in-the-red public housing authority is set to lose millions in funding from the federal government. The Wall Street Journal reported that the New York City Housing Authority (NYCHA) is facing a $35 million funding cut, the largest in five years and the first cuts New York has received under the Trump administration. That figure breaks down to $7.7 million in housing voucher funding (Section 8) and $27.7 million in operating funds. NYCHA units are home to more than 400,000 New Yorkers, so the funding decrease is sure to have a negative impact on some of the city's most vulnerable residents. Even though the agency ended last year with a $21 million surplus, it now confronts a $14 million—or greater—deficit. Despite Mayor Bill de Blasio's recent pledge of $1 billion to shore up faulty roofs, NYCHA faces an estimated $17.1 billion shortfall in capital repairs that consign residents to live with mold, lead paint, vermin, and, in low-lying complexes, Hurricane Sandy damage. The WSJ reported that up to $150 million in cuts to the agency are possible, and those cuts would reverse any recent improvements NYCHA has made. "The direction we're moving in is one where public housing is drastically different or doesn't exist," NYCHA chair Shola Olatoye told the WSJ. "The progress we have made over the course of the last three years—it's not that it's at risk. It evaporates." NYCHA is looking for money in all the places it can, but some fear that revenue-building initiatives like the city's plan to build infill housing and sell housing authority property could compromise the agency's mission.